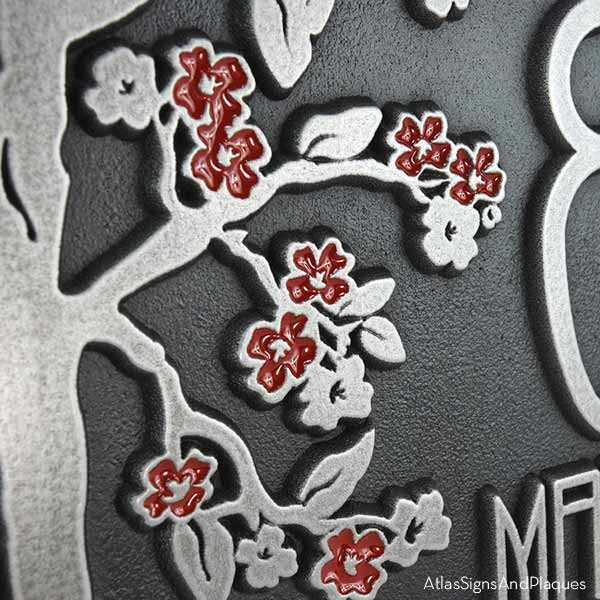 We took our very popular Blossom Tree Plaque and did something more crazy than usual. We turned it in to a [insert drum roll here] the Rectangle Blossom Tree Sign. Too much for most, but we are living on the edge lately. 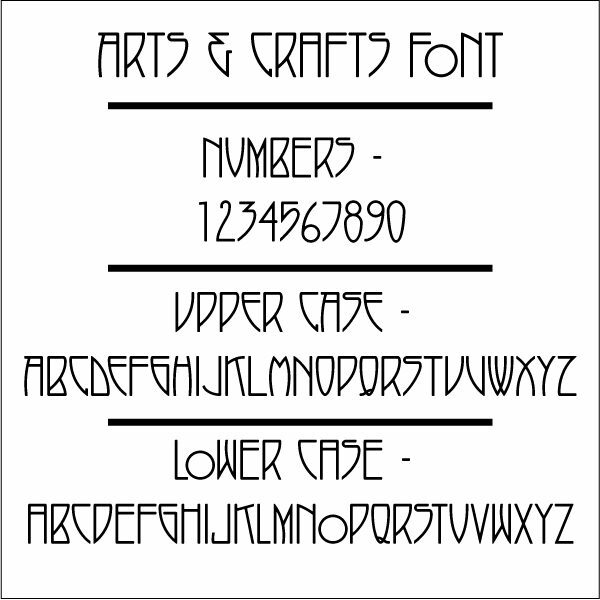 Have it as an Address Number Plaque, or a Phrase Plaque by inserting a favorite quotation or witty saying. This makes a very personal and thoughtful gift. The painted blossoms with high quality enamel is a little extra though…so choose that option if you like in white, red, blue, yellow, purple, and more. Click on a box below to select your metal coating and patina finish. Click on a box below To SELECT your hardware option. 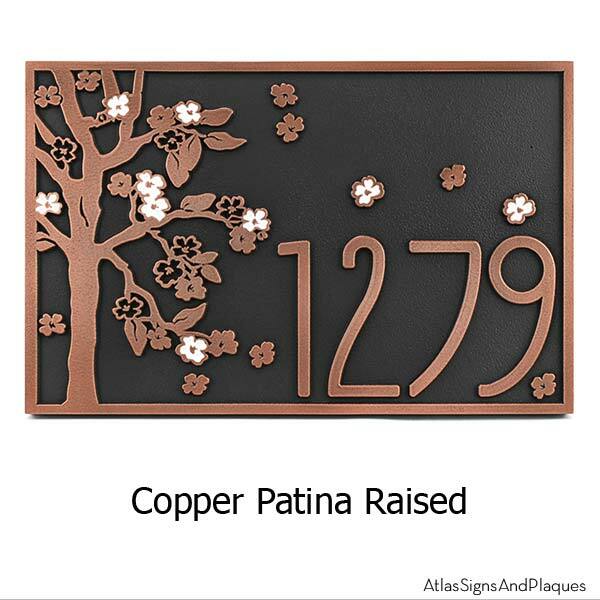 Share and Connect with Atlas Signs and Plaques! The more you say the smaller the letters. If we have a problem getting everything on there or if we don’t think it will look right…we will let you know before we go to production. If you need it two sided let us know that to and we will give you a firm quote. In Japan, the Cherry Blossom season coincides with the beginning of the year and thus, it marks the arrival of new beginnings. Students start their first day of school and new employees start their first day of work during blossom season. And that is why this tree is a symbol of hope. New beginnings allow us to have hope and dream of great things. 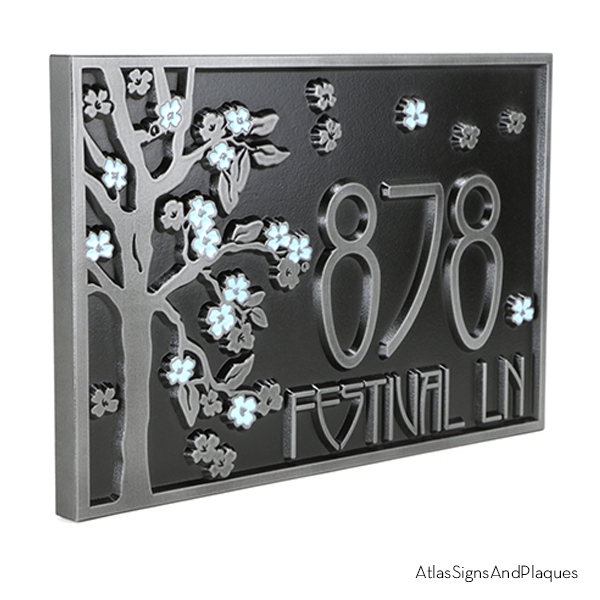 A blossom tree address plaque on your front door will let your visitors know that a household filled with optimism and enthusiasm lives inside! 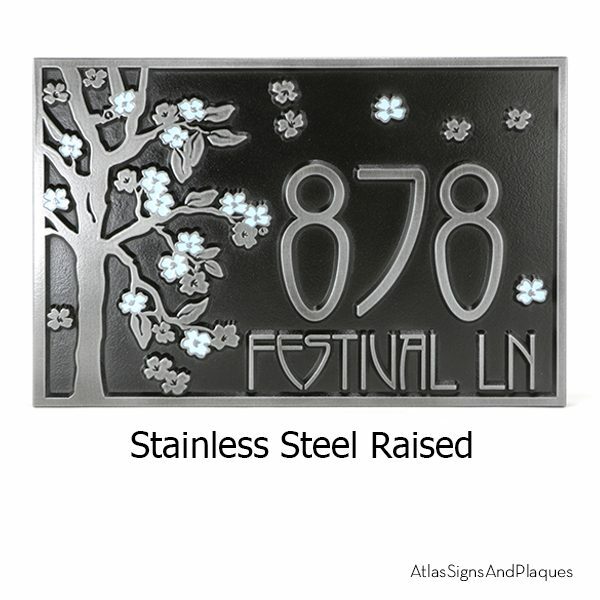 Our 8-step-process applies real metal to a durable HDU base giving your Atlas sign or plaque the ageless beauty of real cast metal without the weight, cost, or limitations of castings. Atlas Signs and Plaques will not rust, rot, fade, or promote insects and are suitable for exterior applications. All signs and plaques have a substrate of man-made materials. Specifically, 30 pound High Density Urethane(HDU) sign board. This is a product that was developed for the aerospace industry and has been used for signage for over 40 years. 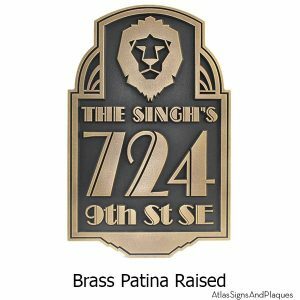 We coat our HDU signs and plaques with a cold-applied, REAL metal coating that is in use world-wide as an architectural and industrial coating. It is a well-proven, tough, and beautiful coating that gives the look of cast metal without the limitations, price, or weight. 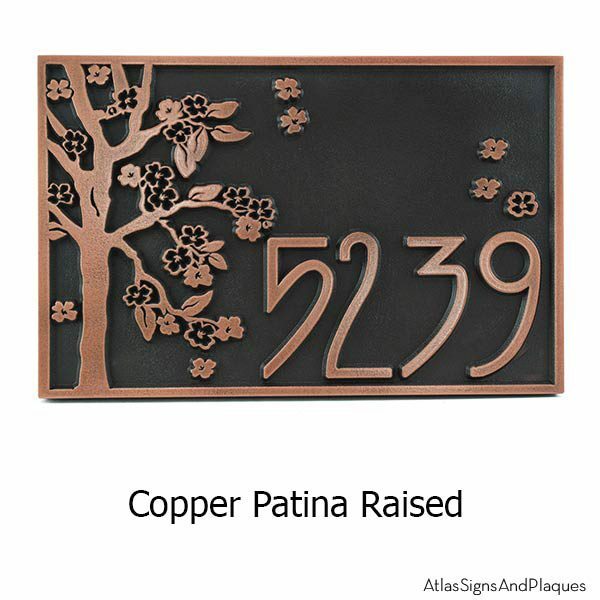 Every sign or plaque created by Atlas Signs and Plaques is handcrafted, meaning made-by-hand. That means that your plaque is totally unique from every other, and has been “touched” by many different hands. Different hands mean that there are variations in the look and finish of your sign. Your plaque undergoes 8 different steps before it is shipped off to you. 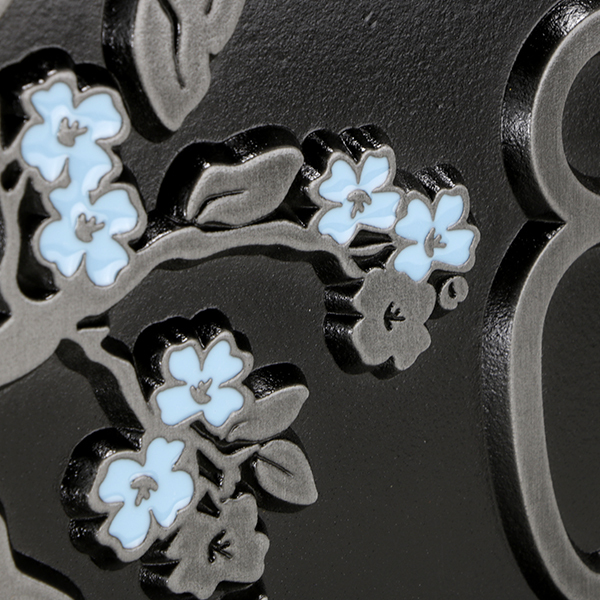 Each step imparts a level of uniqueness making every plaque a true one-of-a-kind customized purchase. These normal variations, little bumps, waves, and other variations in the finish, that might be called defects by some, are part of the charm that only a handcrafted item can deliver. At Atlas, we celebrate these variances. They make our creation, and your plaque, incomparable. What Finish – Trying to decide the metal you like. Here you can find more detail. We love hearing from you. Email us your testimonial and a picture of your sign and we will send you a PriZe! Woohoo! Thank you for sending me the awesome gift 💝! But truly YOU are the AWESOME ONE ☝️!!!! 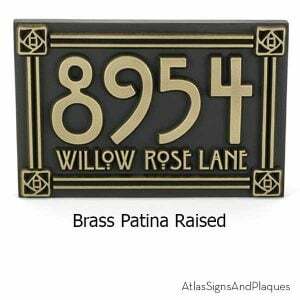 Customize your American Craftsman Address Plaque with anything you want it to say! We love our repeat customers! Gower Veterans Memorial, Missouri. We are so incredibly proud to have been a part of this! I am in LOVE with my sign! I LOVE it so much that I wish I had more houses just so I could buy more signs. The quality is outstanding A++++++++ !! Il looks so rich and it makes my house look rich GREAT curb appeal. I just got them both!!!! Love them!!!! Thank you so much!! Wow!!! You and your team are so wonderful and talented!!!!! Love love love!!!!!!!!! It is a long story but we finally have a new house sign at Leeward. It arrived and looks great. I received my house number sign last week and I love it! Thank you for our address sign. We love it and get a lot of compliments on it. The pictures do not do it justice. Just got it. Sign is beautiful. I received my custom address plaque yesterday. It will definitely add a ton of curb appeal to my new home once I install it tomorrow. I looked at all of your address plaques and love them all. This one fit my required dimensions. When amazon asks me to rate this product it WILL receive 5 stars . I will also add pictures mounted to exterior brick. Finally got our house sign up. Photo doesn’t do it justice. It looks so classy and elegant on our rock wall. I couldn’t step back far enough to capture it all, with palms, orange trees, hibiscus etc. peaking over our outside perimiter rock wall. Thank you for going the extra mile on this order. It’s just PERFECT! We just love our plaque!! LOVE…….LOVE……..LOVE our address plaque. THANK YOU!!!! Thank you so much for our address plaque, it’s so unique and adds so much character to our house! Attached are a couple photos! Very timely and very well made, my husband and I are very happy with our order! I just wanted to drop you a line and let you know what a hit the plaque you made for my grandmother was. They had the big party for the building last night, and there were dozens of people in attendance, all of whom thought the plaque was beautiful and wanted to know where we had gotten it. Of course we told them about you and you may have some customers in North Dakota coming your way. So thank you, for the beautiful work you do and for dealing with our ever-changing order and for getting the sign to us in time for the party. I’ll definitely be recommending you in future. Keep up the good work. Just wanted u to know my sign arrived yesterday. Thanks much for packing it so securely! I absolutely LOVE IT! Fantastic job! Thanks much also for the cute Home Sweet Home, it is already found a place. We just put up our sign, and love it! We’ve named our home after the very first owner (1928) Marie! Thanks for all your help and the beautiful work!! I love my new address plaque that your company made………..a beautiful finishing touch to our western style front porch! Glad I found Atlas on the internet…….such choices and great workmanship……..definitely worth the price and wait to have it custom made! Thank you for the spectacular design and creation of my Rhino address sign!! It stops traffic and was meant to be on this wall!! It’s perfect! I cannot thank you enough for this outstanding work of art!! You get my unrestricted recommendations!! Looks awesome on our 1924 house. Thank you for the wonderful sign! Aloha! Wanted to say thank you so much for the wonderful house number plaque you made for us. It’s high-class, and makes our home stand out in a major way from the others. finding a reason to order more signs. You did a beautiful job. We LOVE our plaque! Thank you! The sign arrived and it looks awesome! Everything we so well from the order to advise on the finish to delivery! We love it! Here are some pics of our sign for you PRiZe promo. We think it looks great! Wanted to show you a picture of our sign up on the wall by our front door. It looks fantastic! Thanks again. Love the sign and quality exceeded my expectations. Thanks for your help in making the marker. I am very pleased with quality. Love our new sign! Thank you so much! LOVE my plaque! Thanks for the prompt service & the classy solution to my problem! Thank you so much for my beautiful address sign, I love it! Looks great in our school garden. Thank you so much! Last weekend I received and installed my new plaque. Thank you. Attached is a picture for your information and use! I wanted to send you before and after photos of the columns outside our building. We just received the sign. It’s beautiful and exactly want we wanted. Here’s the photo you asked for. We just completed a major renovation of our house exterior and the address plaque just adds that finishing touch. Looks great! I just wanted to take a moment and thank you again for such a wonderful product. I had so many compliments on it from the neighbors and even my mailman. Wishing you all a healthy and happy new year! I cant submit a review til later according to my etsy but i wanted to say how much we love our sign. My husband was at first shocked that i would buy a no soliciting sign that costs that much as opposed to just going to lowes or home depot to get one under 10 bucks. But it would not look ok in our neighborhood if we bought something from lowes or home depot!! He loves it and we cant believe how good it looks! Thank you also for the easy assembly and instructions! This sign is absolutely gorgeous. everything i hoped it could be. you all did an absolutely amazing job, i’m so grateful. thank you thank you THANK YOU!! Brian, I received the address plaque today, and it is stunning to say the least! in wrapping it with the Thank You sticker on it too. Nice and personal touch. Exceptional look and excellent build quality. I live on the coast in Central California and everything corrodes in the salt mist and fog being only 100 yards from the Pacific Ocean front. Installed two signs showing the address in March 2010 and they both look like new, today (April 2016). Have now ordered an additional 2 to advise of camera surveillance. Thank you Janey for bringing this product to market. I wanted to send these photos along to you of the new business sign you made for us. These pics aren’t the greatest because of the time of year (snow and dead plants, etc). Maybe once spring/summer is here I can get some better shots. This is going to work quite well on the easel that we purchased so that we can direct people away from our front door entrance and have them enter our studio space at the side door of our home. I think it looks great on the easel! And, we’ve used it already and it does the trick. So, thank you again for all of your help and input, and most importantly for producing such a high-quality product. We love both of the signs we’ve purchased from you and we would highly recommend you to others (have already done so and will continue to do so as people ask about the signage). Just wanted to let you know I received the sign today and its beautiful! I suspect you will be getting some new orders once we hang it and my neighbors get to see it! Thank you for the front mount copper sign street plaque. I’m very pleased with my purchase, this helps add the architectural interest necessary to bring my Reno to a finale. We LOVE, LOVE, LOVE our new plaque. It’s so beautiful and our friends and family (and in social media) love it too! The style is perfect for our 1909 Craftsman style American Four Square (and it even looks like a traditional mail slot from afar!!). You guys do amazing work, I’d love to get a personalized address sign someday! Hope we win! Thank you, so very much. The plaque just arrived and I can’t wait for my daughter and son-in-law to see it. they will be thrilled! We are so happy to be doing business with your company…we love supporting a small business, your located in our beloved WI, and I love that it is run by women!! We were looking around for a non run-of-the-mill type of address plaque…one with a little funk. So happy we found Atlas Signs and Plaques! Now, we can’t wait to get it and hang it proudly. Sign arrived safely and looks great, just as I knew it would! Good Job, Good Service. Great way to make our new home feel like home! In June, I “speed ordered” a wonderful plaque from you and you did an amazing job with creating it and sending it super fast. it looks beautiful and perfect, and it was a great success. The wife of the person this was dedicated to was and is very moved and since then friends come and donate plants for the Friendship Garden. I have attached 2 photos, so you can get an idea how it looks at its new location. Thanks so much for making this possible for us, and I hope I can order something soon again. You have an amazing selection. My sign pic! I love it! Love the plaque! Thank you. I just received my new Craftsman style plaque in the mail. It’s fabulous! And you guys really do it right – loved the quality of the packaging, the Thank You sticker and the mounting template. We’re renovating a 1900 bungalow and are trying to give it Craftsman elements. This will make the perfect statement as you come to the front door. Can’t wait till we get that far along on our project. Our new sign is absolutely perfect on our new home. Thank you so much! You were the most expensive of the four or five we we searched. And one company thought the product was great(they seemed jealous) but we were talking a metal plaque with that firm too. Can this be hung outside? We live in Marco Island, it gets warm here in the summer my concern is it will fall apart or not stand up very well. What’s your opinion. If it works fine but what kind of care will it require? It has no use but for the exterior of our home. Thanks, it is wonderful. And I repeat beautiful. We will be sure to refer you to anyone who asks where we purchased it. We are very happy with our plaque (ordered 9/2012), and yesterday a builder mowed it down and it is broken. Got it and LOVE it!!!! Thank you so much for your help – this is exactly what we both wanted!!!!! We put up our new signs this morning. They look AWESOME!! The sign arrived yesterday it is absolutely perfect. we love it. It turned out better than we expected – thank you so much. We will be hanging it today on our lava rock wall at top of our property, we will send you a picture. YOU MADE A 60 YEAR OLDS DAY!!! THANKS FOR YOUR BEAUTIFUL WORK!!! Our plaque and your efforts arrived an hour ago….. I expected Good…what I got was EXCELLENT…..I cannot believe how your work exceeded my expectations. And the effort you put into correcting the missing order. Great to have customer service in the USA..a USA Made product and your caring efforts. (Yes, I will be back for some additional signage). This sign just cracked me up!! Such a polite way to send solicitors away……AND, having my daughter girl scouts when they were younger, we all love buying Thin Mints!!! I received the plaque yesterday! It’s beautiful! I can’t wait to give it to my parents for Christmas and see them hang it on their new house. It is perfect!!!!! Thank you! I will send you a pic once it’s up on the house (hopefully this weekend! supposed to be nice here). These signs are AMAZING! Mine look like rusted steel. They look awesome on the house. THANK YOU!!! The styling is great and fits well with the front of our house. It’s lighter than we expected which made mounting it quite easy. The quality is top notch. Thanks so much for such a beautiful sign! I Love love love it! and posted it on my instagram yesterday and the response was massive! I just wanted you to know I received the plaque yesterday and it is beautiful! Just got the sign in and it’s INCREDIBLE!!!! Thanks so much for doing this. As soon as we mount it I’ll send you the pic. My parents just built a craftsman-style home and I was searching for the perfect gift. After pouring over pictures of their home in progress, I decided on this style. My parents are THRILLED. The best part was when my brother sent me a picture showing me the address numbers next to their front door handle plate. The four squares in the corner echo the squares of their authentic craftsman door hardware. Must be serendipity. However, I wish the seller had provided a tracking number. It would have made the waiting process before Christmas a lot less stressful. I gave my parents the plaque over the weekend and they loved it (as do i, it looks great)! Thanks so much, I will definitely be recommending Atlas Signs and Plaques to my friends and family. Samantha 12/22/11I just wanted to send a follow-up note to say thanks. The house number sign arrived and they love it! Received my order today–and just wanted to let you know–it is perfect–just what I was hoping it would look like. Looks great! Thank you. Happy Holidays! The sign arrived and it is perfect. I wanted to let you know that we got the plaque – and it is exactly what he wanted. Thank you so much for your help and patience! Love the sign, really looks nice! Will send photos when we get our wall up with the sign, we have the stones for the walls and columns, just need the time! Hi Janey – Got the signs! They do look great! Thanks! Dear Janey — I love-love-love our finished address plaque which we received in the mail last week!!! We haven’t hung it yet… but I am 100% it is going to be a beautiful addition to the front of our new home, so different and unique. Thank you! Janey: I’ve been very remiss in letting you know how pleased I was with the way our address sign turned out, not to mention my wife’s surprised reaction when I presented it to her as a gift. It’s now hanging proudly next to the front door of our freshly-painted vacation home in the mountain community of Big Bear, CA. The address plaque arrived. It looks great! Thanks. Received my plaque today! It’s more beautiful than I expected. Thank you!! OMG! the sign is beautiful. Once it is hung and in place, I will take a picture and send it to you. I can’t believe how beautiful it turned out. The location it will be displayed at along with the hardware you suggested will fit our park perfectly. Thank you for everything you did for us, Tunkhannock Township, Monroe County, PA. I have received it and already installed it. It looks great – thanks. The signs are AMAZING!!! My landscaper is impressed (not to mention my neighbors!). Arrived….phantastic! HOuse not yet completed, will photograph it landscaped and send you pix. I received the sign today and WOW! It looks fantastic. I can’t wait to have it installed. Received the packages this morning. The plaques look great! I’ve already started advertising for your company here at school! Received yesterday. Looks awesome! Thank you. Hey, I am so sorry I have to apologize, I meant to tell you I Absolutely LOVE my sign you made with the verde brass and pineapples/family name and year est! Everyone admires it, most of all me! I can’t wait to order more in the future! Your work is Marvelous, very artistic and you have been an absolute PLEASURE to work with! Good morning…rec’d plaques yesterday and opened them last night…..thank you so much for the great products you sent….they are going to look good on the wall we build…Eloy and Gloria (His Wife, who has been with us every step we’ve taken) truly like them. Thank you and your staff for all your help with this order. ..and saving us a lot of headaches….should you ever need a referral from us…you’ve got it. Take care, peace…Carlos – Click here to watch the memorial in progress as well as contribute if you like. Thank you for your professional and generous work (and t I m e) in “perfecting” the elegant wall plaque. Mounina’s family traveled form Senegal for the Dedication ceremony and luncheon with family and friends. The plaque is so beautiful and the quality of the craftwomanship beyond compare.